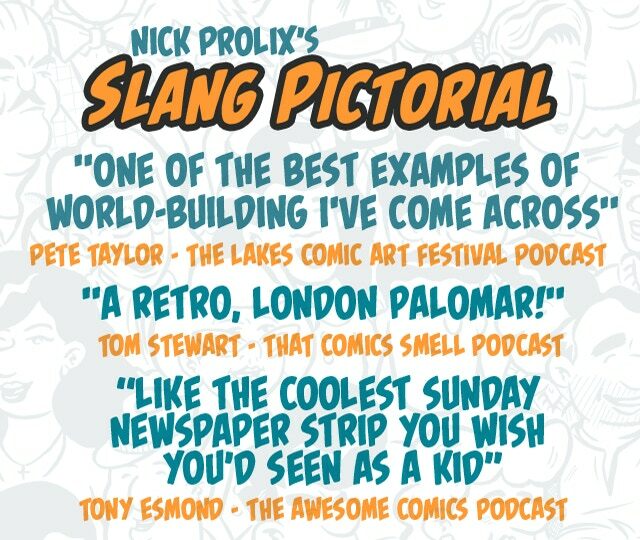 Hi Nick, what can people expect from this new issue of Slang Pictorial? 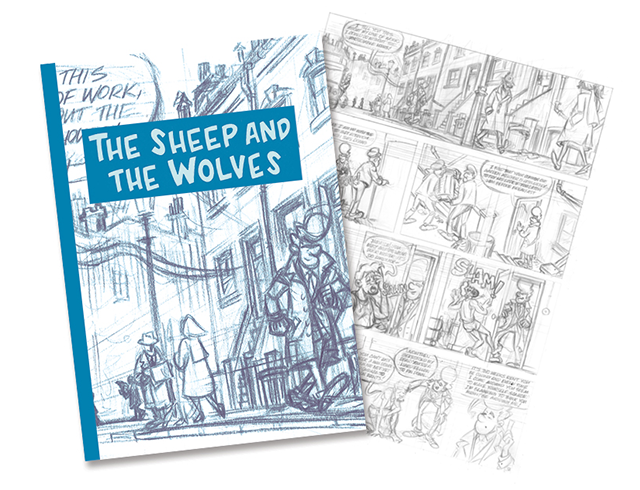 Issue 4 contains a couple of firsts for me, namely a collaboration in which I invited a writer to pen a story set within my world of "The Sheep And The Wolves" and which I have then drawn which was a really interesting experience. As well as that, due to the fact that I switched printers last year, I am now able to include a colour strip within the comic for the first time, and so I've drawn a little a short auto-bio comic of sorts which again was a lot of fun! On top of that you've got the continuation of both the "Atlas Unfettered" and "The Sheep And The Wolves" storylines in directions that will show some of the characters having to deal with a bit of the emotional impact of some of the recent events that have unfurled. Is this a world that you could re-visit for ever or do you really hanker after, for instance, doing a series set on a spaceship? I think I have said elsewhere that initially I saw "The Sheep And The Wolves" as the first chapter of almost a cross-generational saga that would see characters age and develop over decades and that's still the plan, even if I'm no longer entirely set on sticking with that initial chapter-by-chapter structure. 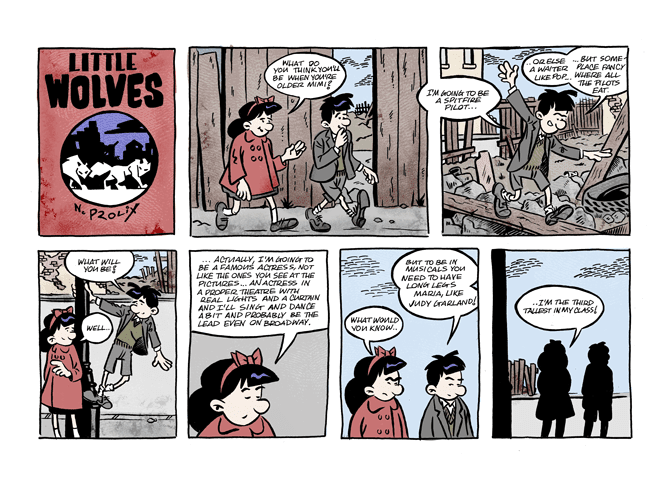 In this issue for example, you'll see a flashback to Jimmy Angel as a teenager in the 1950s as well as the return of the "Little Wolves" strip which shows an even younger Jimmy in short trousers. As for other projects I am always toying with ideas for something completely different and to be honest there are actually some mechanics I've already built into the format of the anthology that could allow for a spot of genre-bending. One example would be a fantasy/historical action comic version of one of Vic Corinth's "sword-and-sandal" flicks in a way similar to Beto's "Fritz" movie comics. Ultimately I see myself making comics set in Bouveray Town NE1, for as long as I can hold a pen and I would be very happy to be even tangentially considered as working in the same tradition of monomaniacal cartoonists as Stan Sakai with Usagi and Jaime Hernandez with Maggie and Hopey. I love the ligne claire style and that you do your own lettering - how important to you is doing your own lettering? Why do you think more people don't do it? Thanks! It does surprise me that people seem to really dig the lettering and it's often something that gets commented on a fair bit. As with almost all of the formal/aesthetic choices in the comic it's a mixture of period nostalgia and a love of the craft of old-school comics production, mixed with a healthy dose of looming deadline crunch and pragmatic workflow decision-making. 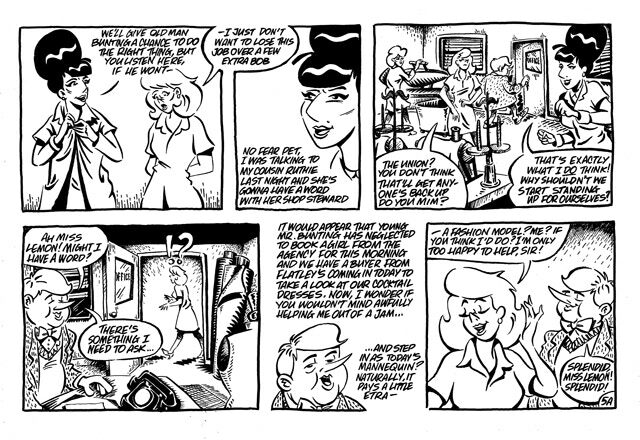 I want "Slang Pictorial" to look and feel like a newspaper strip from the Fifties or Sixties and so the tools and techniques I use are pretty much those that classic cartoonists from the period would use, i.e. dip pens and an Ames Lettering Guide, to zip-a-tone dot-patterns and a ton of white-out for mistakes! Hand-lettering is something I had to learn from scratch and you can see my development from issue 1 to 4 and I am still developing and growing as a letterer with each comic. Why don't more people letter by hand? Partly it's because of the shift to an all-digital workflow for a lot of artists as well as the availability of so many excellent digital fonts that can now emulate hand-lettering even down to multiple variations for each individual letterform and which can now give digital lettering a very organic and natural-looking bounce. 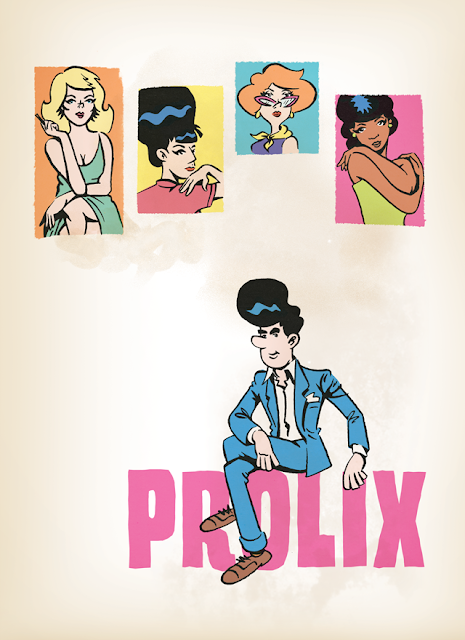 Again for me, it's wanting to situate what I do within a particular comics tradition and the cartoonists I most admire, like Seth or Dan Clowes, hand-letter and that gives their work a real idiosyncratic and immediately recognisable quality which is something I want my comics to share. You got funded on Kickstarter in less than 90 minutes - how surprised / overjoyed were you by this? It's always amazing when you hit that target and you can breathe a huge sigh of relief knowing that the project is going to get funded. Slang Pictorial #3 hit it's target in under 12 hours and that was huge for me as it was my first ever time on Kickstarter and I really had no idea how it was going to go. I won't say with #4 I was specifically trying to hit that 90 minute target but I did do a lot of work before hand in an effort to try and beat that previous result. So I set up a pre-launch mailing list, did a lot of Instagram and Twitter promotion to start hyping up the launch as well as offering a couple of Early Bird only rewards for backers who pledged on the first day. The point of doing all of that was to try and get us over the line as quickly as possible, but the fact that the project funded as quickly as it did is ultimately all down to the fantastic folks that jumped on board and did such a great job sharing and spreading the word. What tips would you give anyone thinking about running a Kickstarter campaign? Is it about having a low target? Great rewards? 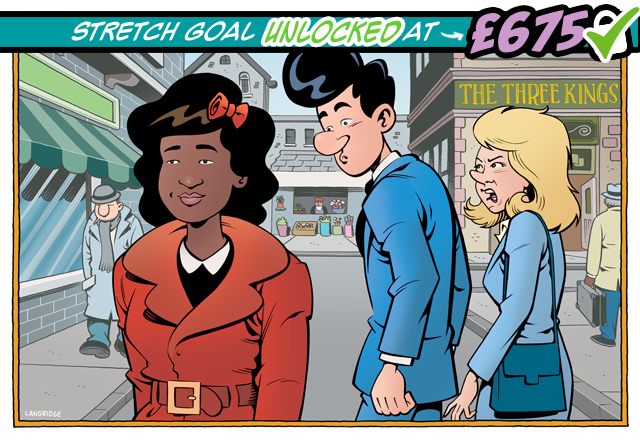 Great stretch goals? This is only my second Kickstarter and so I don't know how much advice I can really give other than look around at what works for other people and see what you can steal that will work for you. I am a big believer in looking to the creators whose work you admire and whose success you wish to emulate. The other thing I would add is think about your page structure and your promotional material and try and have as much of that prepped before hand as possible, the less time you have to spend producing new artwork for stretch goals and updates during the campaign is more time you have to actually focus on promotion and spreading the word about your project. That really was a matter of hearing Tony make a passing reference to a 1970s set heist comic he had written during one episode of The Awesome Comics podcast. I just tweeted him saying that sounded like something right up my alley so he sent me the script to read. I loved it and told him so, and just said that if he didn't yet have an artist onboard that I would love to take a crack at it and the rest as they say, is taxidermy! 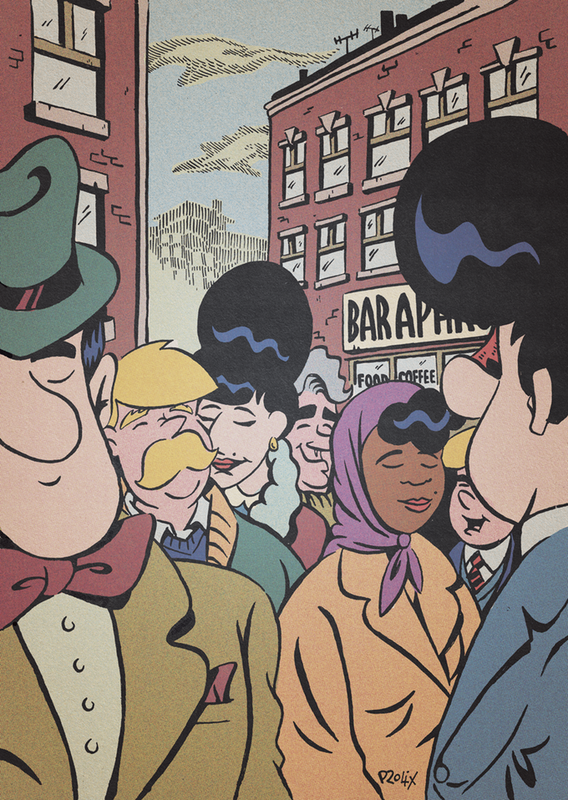 What was the last comic YOU backed on Kickstarter? Again after hearing the cartoonist interviewed on The Awesome Comics pod, Glorious Wrestling Alliance by Josh Hicks. You've managed to get progressively more and more comics (or comics collaborations) out there each year - do you have a target that you set yourself about how much comics work you want to get published each year? Not a specific target as such other than I have tried each year to put out more than the previous year and so far that's worked out. My goal this year is to Kickstart two issues of Slang Pictorial and so I am hoping to come back to crowd fund issue 5 in the autumn/winter of this year. Two issues in a year will be a big step in terms of productivity and output but ultimately I would love to get to a point where I can publish Slang Pictorial on a regular quarterly or tri-monthly schedule. 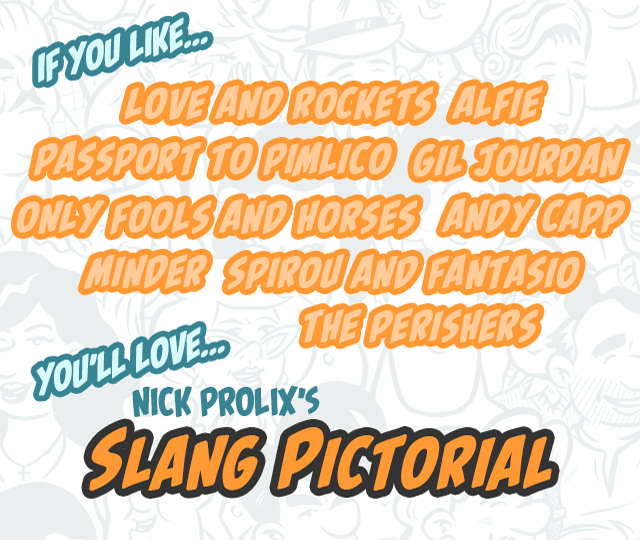 Alternatively I can envisage putting out a larger, weightier version of Slang Pictorial annually, more like the Franco-Belgian album style publishing model. Again, I've not yet decided which route to take but either way, the plan is to be putting out more quality story pages every year for sure!